Thiruvannamalai is an ancient town placed in the foothills of Annamalaiyar range that is around 195 kilometres away from Chennai. The British regime often referred to it as Trinomalee or Trinomali. The town is one of the famous religious pilgrimage sites featuring several temples and ashrams including the sacred shrine of Lord Arunachaleswara and ashrams of Seshadrinatha Swamigal, Yogi Ramsuratkumar and Ramana Maharshi. It takes approximately 4-6 hours to reach Thiruvannamalai from Chennai. The winter season between October to March is the best time to explore Thiruvannamalai. Thiruvannamalai is not accessible via a flight from Chennai. But, frequent trains and buses are running to and fro Thiruvannamalai. The Thiruvannamalai railway station is well connected to major cities in South India. The best way to uncover the hidden jewels of Thiruvannamalai is by road as it is easily accessible via the Puducherry-Krishnagiri Highway. There are two-wheelers and bicycles available for rent for commuting within Thiruvannamalai. Alternatively, there are autorickshaws and buses that help travellers commute within the region. Since route 1 takes the least time to cover the distance between Chennai to Thiruvannamalai, it is considered to be the best route to travel. The metropolitan capital city of the state Tamil Nadu is placed on the southeast coast of India and offers the best experiences of both sea and land with its heritage temples, churches and gorgeous beaches. Chennai is also an excellent place to savour delightful delicacies and shop for both cosmopolitan and traditional items. Chengalpattu is 62.5 kilometres away from Chennai and roughly takes 2 hours to complete the journey. Blessed with incredible natural beauty like lakeside vistas and historic temples, Chengalpattu is placed in the Kanchipuram district of Tamil Nadu state. This little town is a great transit stop to popular destinations like the Vedanthangal Bird Sanctuary and Mamallapuram. The city has a rich history of mighty empires including the French colonisers that resided in the area and fought many epic battles. The iconic Kolavai Lake, the Madras Crocodile Bank and the Vallam Reserve Forest are amongst the notable attractions in the small little town. The remaining 132.5 kilometres can be covered in 2 hours and 30 minutes. 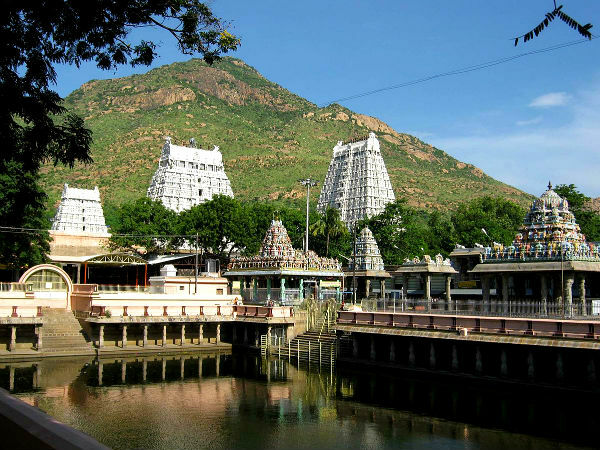 Thiruvannamalai has a wide array of temples and historic sites that catch the attention of several travellers. One of the reasons why people refer to it as the Temple Town of South India. This humongous temple is placed in the foothills of the Tiruvannamalai range and is spread over an area of 25 acres amidst nine high towers. Finely carved pillars and sculptures decorate the several shrines and other enclosures in the region. These inscriptions were done between the 10th and 16th century. This temple features the five principal elements: land, water, air, sky and fire. It is one of the few Pancha Bhoota Stalams in India. The festive days of Giri pradakshinam and Girivalam on the full moon day is celebrated with great pomp and glamour. More than three million devotees and visitors visit the region during these festivals. A 20th-century saint named Ramana Maharshi resided here and taught people to lead a simple and uncomplicated life through meditation and spiritual sermons. This ashram is maintained and managed by his disciples and is one of the tourist hotspots in the region. The saint is said to have attained mukthi in 1950. Placed 5 kilometres away from Jamunamarathur, the Beema Falls features water for close to eight months in a year. Bathing and diving is fun and exciting experience due to the reduced water force. A massive lake on the Javadhu Hills and is fondly known as the Kolappan Lake. There is an artificial human-made island at the centre of the lake that attracts several tourists and visitors. To meet the tourist's demands, the officials have introduced boating facilities. Kavalur Observatory is just 11 kilometres away from Jamunamarathur, sharing borders with Vellore district. Being the biggest observatory built in Asia, managed by the government of India, stargazing and research are two main activities followed in this observatory. Several scientists and researchers come over to the research centre to complete their studies. Positioned 75 kilometres away from Thiruvannamalai, the region has several tourist attractions like the Beema falls, Amirthi Forest, Glass House, Komutteri Lake and Kavalur Observatory. This is one of the hotspot regions that you should not miss out during your trip. Positioned 35 kilometres away from Thiruvannamalai and built across the Ponnaiyar river amidst the Chennakesava Hills is Sathanur Dam. It houses a lush-green foam park, tall trees and a mini zoo with an inbuilt crocodile farm. This ancient village features several temples and is placed 35 kilometres away from Thiruvannamalai. There are ruins of a 13th-century palace of the Sambuvarayars, the vital clogs in the Chola empire in its neighbourhood.